Alpine Groves Park (AGP) is comprised of approximately 55 acres situated in northwest St. Johns County. The major natural communities found at AGP include wetland/forested mix, upland mixed coniferous/hardwood, upland hardwood forest, and pine flatwoods. The Category I invasive plant coral ardisia (Ardisia crenata) has started to overtake the forested understory at AGP. In 2008, St. Johns County applied for and received a grant through the Florida Bureau of Invasive Plant Management to remove approximately five acres of coral ardisia from the park. In May of 2009, a State contractor sprayed the ardisia and within weeks, most of the ardisia was dead, preventing any new berries from sprouting through 2010. However, continued monitoring and treatment is necessary to eradicate AGP of coral ardisia. Canopy Shores is located off US1 at the northern end of the St. Augustine Shores development. This 33 acre park will provide direct public access to the Atlantic Intracoastal Waterway once park development is complete. Three natural communities exist at Canopy Shores with the majority of the park being upland mixed coniferous. Hydric pine flatwoods and tidal swamp are also located at this site. Canopy Shores is a pristine ‘old Florida’ habitat with mature live oaks, Spanish moss, magnolias, palmettos, and other native vegetation. However, approximately 1.25 acres of Chinese tallow was located in the southeastern part of the site, bordering the Intracoastal Waterway. Tallow can spread easily through water channels, so it was essential this location be managed to avoid dispersal along the Intracoastal Waterway. In the fall of 2009, land managers representing not only the County, but the Nature Conservancy and the Guana-Tolomato-Matanzas National Estuarine Research Reserve eradicated Canopy Shores of its existing Chinese tallow. Further monitoring is continued by County staff to make sure the tallow doesn’t begin sprouting again. Spengler Island is a pine-covered island in the San Sebastian River just north of King St. The County purchased Spengler for wetland mitigation to off-set wetland impacts from County projects. In order to get mitigation credit, part of the management for the island includes invasive species removal. When purchased, Spengler Island had a thriving population of both Chinese tallow and Brazilian pepper trees. Since 2008, County staff has removed the species manually and through the use of herbicide. The island continues to be monitored and removal activities are on-going, but the majority of the invasives are gone. The Vilano Bridge parcels consists of a former oceanfront restaurant site (Fiddlers Green) as well as the small boardwalk park at the eastern foot of the Usina Bridge located 0.3 miles northwest of the restaurant. There are three natural communities found at the oceanfront site consisting of beach dune, coastal berm and coastal strand. The parcels near the bridge contain mixed scrub-shrub wetlands and tidal marsh. The oceanfront parcel contains several areas of Brazilian pepper concentrated around the edges of the current building and the Brazilian pepper has begun spreading into the dunes. The invasive asparagus fern is also an extremely prevalent plant among the habitat. Dunes are extremely important for a variety of birds and the listed gopher tortoise and beach mouse so it was essential to remove these plants. The parcels that sit at the base of the Usina Bridge contain about 1.3 acres of Brazilian pepper. Other invasives present include (Australian pine, asparagus fern, giant reed), and several dead red bays, caused by the invasive ambrosia beetle. On July 8th and 9th, staff from St. Johns County and the GTM NERR coordinated with the Student Conservation Association (SCA) from inter-city Jacksonville to rid these Vilano parcels of Brazilian pepper. Over three large dumpsters of Brazilian pepper were removed and mulched, which is acceptable if there are no berries present. The County hopes to rid their property of the other invasives within the next year. The Vilano Boat Ramp, located on the west side of the Usina Bridge, contained four large Brazilian pepper trees, as well as several small to medium size bushes. On October 20th, 2090 the County along with staff from the GTM NERR and FWC eradicated the Brazilian pepper from this site. Continued monitoring and maintenance is expected. Joel A. “Bubba” Williams Windswept Acres is a three acre park that lies directly on the Scenic and Historic A1A Coastal Byway in Crescent Beach. The natural community in the northern section of the park is wax myrtle/willow habitat and until the summer of 2009, was approximately 15% Brazilian pepper and Chinese tallow. Over the summer of 2009 County staff coordinated with the GTM NERR and the Student Conservation Association from inter-city Jacksonville to rid the park of Brazilian pepper. About three dumpsters were filled and mulched, which is acceptable if no berries are present on the trees. In early fall 2009, Chinese tallow was also removed from the park. 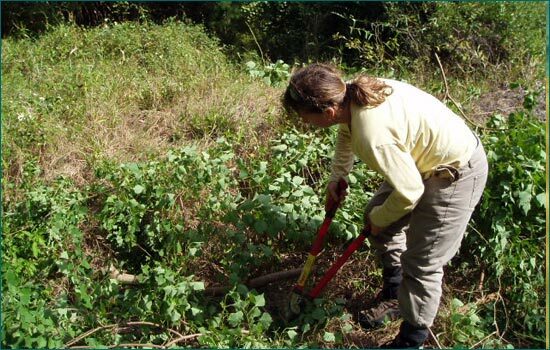 Since these invasives comprised approximately 15% of the vegetation, their removal created visible gaps where the invasive plants outcompeted everything underneath. These areas will be designated habitat restoration areas and will be monitored for removal of resprouts of invasives, but also to determine which native vegetation will naturally grow in.